The state will continue to cut healthcare spending this year. As set out in previously adopted laws that will come into effect in 2013, the reduction in budget financing will be offset by the Russian taxpayer. The state plans to cut health spending by 8.7 percent in 2013 and by 17.8 percent by 2015. The reason for the reduced spending is the general redistribution of budget expenditures toward defense and security, which will grow by 25 percent to 2.3 trillion rubles ($76 billion) in 2013. The new legislation, which came into effect on January 1, 2013, sets the average standard financing for the provision of free medical care at 22,120 rubles ($730) for Moscow and at 9,032 rubles ($300) for the rest of the country. Starting Jan. 1, Russians will have to pay for every service that is not part of the compulsory health insurance standard package, including visits to specialists. Russians will have to pay for medicines that are not considered vital, as well. However, the law states that, if a certain medication is required to save a patient’s life, or if a patient has an allergy to available free medicines, then the emergency drug or alternative drug should be provided free of charge. As announced in 2012, sales of over-the-counter drugs in supermarkets will be postponed indefinitely. The move has been backed by the Ministry of Health, which decided that sales of over-the-counter drugs in retail stores may lead to a proliferation of poor-quality, counterfeit medicines and result in uncontrolled price growth. Patients will also have to pay for ambulance services if they do not have compulsory health insurance. This does not mean that people will be left to die. The law states: “If additional medical services are required to save a person’s life, then these services shall be provided free of charge.” It is true, however, that medical workers will have to prove they were saving a life at the time. The average cost of ambulance services covered by the compulsory health insurance is set at 1,435 rubles ($47), and patients without health insurance will be billed for at least this amount. 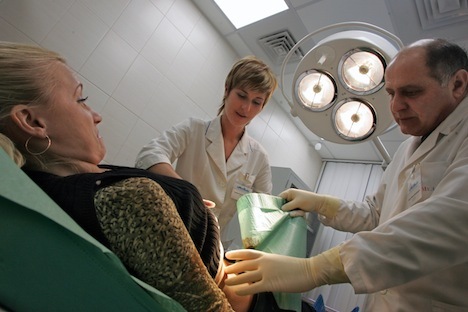 The standard compulsory health insurance package will cover assisted reproductive treatment (IVF) costs, which will improve the birth rate in Moscow, according to Moscow healthcare department head Georgy Golukhov. The real question is whether or not the compulsory health insurance will be enough to offset the costs incurred by medical institutions. The Moscow mayor’s office claims that it will. The Moscow regional program for free medical care guaranteed by the state will increase by 9 percent this year to 260 billion rubles ($8.6 billion).